Vertebra are divided into cervical, thoracic, and lumbar sections, and the sacrum and coccyx are both made up of a series of fused vertebrae. The vertebrae are separated by cartilaginous intervertebral disks. A vertebra is one of 33 bony segments that form the spinal column of humans. There are 7 cervical, 12 thoracic, 5 lumbar, 5 sacral and 4 coccygeal. Vertebra consists of a ventral body and a dorsal or neural arch. In the thoracic region, the body bears on each side two costal pits for reception of the head of the rib. The arch that encloses the vertebral foramen is formed of two roots or pedicles and two laminae. The arch bears seven processes: a dorsal spinous process, two lateral transverse processes, and four articular processes. 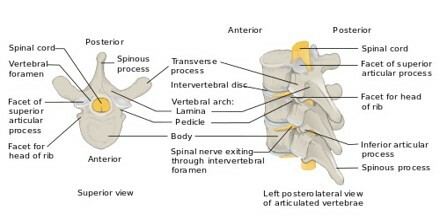 A deep concavity, the inferior vertebral notch, on the inferior border of the arch provides a passageway for a spinal nerve. The successive vertebral foramina form the vertebral, or spinal, canal that encloses the spinal cord. The Latin word vertere, meaning “to turn” or “to change,” and its form versus give us the roots vert and vers. Vertebra is a bone in the spine that allows an animal to turn its head or body. It articulate with each other to give strength and flexibility to the spinal column, and the shape at their back and front aspects determines the range of movement. Structurally, vertebrae are essentially alike across the vertebrate species, with the greatest difference seen between an aquatic animal and other vertebrate animals. The spinous process bifurcates into two parts, and so is known as a bifid spinous process. There are two transverse foramina, one in each transverse process. These conduct the vertebral arteries. The vertebral foramen is triangular in shape. Thoracic Vertebra – The twelve thoracic vertebrae and their transverse processes have surfaces that articulate with the ribs. Some rotation can occur between the thoracic vertebrae, but their connection with the rib cage prevents much flexion or other movement. They may also be known as ‘dorsal vertebrae’, in the human context. Lumbar Vertebra – Lumbar vertebra have very large vertebral bodies, which are kidney-shaped. They lack the characteristic features of other vertebrae, with no transverse foramina, costal facets, or bifid spinous processes. Sacrum and Coccyx – The sacrum is a collection of five fused vertebrae. It is described as an upside down triangle, with the apex pointing inferiorly. On the lateral walls of the sacrum are facets, for articulation with the pelvis at the sacro-iliac joints. The coccyx is a small bone, which articulates with the apex of the sacrum. It is recognised by its lack of vertebral arches. Due to the lack of vertebral arches, there is no vertebral canal, and so the coccyx does not transmit the spinal cord. Vertebra shares a basic common structure. They each consist of a vertebral body, situated anteriorly, and a posterior vertebral arch. The bodies of successive vertebrae articulate with one another and are separated by intervertebral disks, disks of fibrous cartilage enclosing a central mass, and the nucleus pulposus. 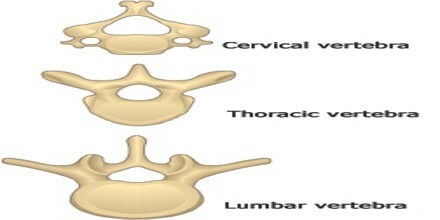 The size of the vertebrae varies according to placement in the vertebral column, spinal loading, posture and pathology. Along the length of the spine the vertebrae change to accommodate different needs related to stress and mobility. Every vertebra has a body, which consists of a large anterior middle portion called the centrum and a posterior vertebral arch, also called a neural arch. The body is composed of cancellous bone, which is the spongy type of osseous tissue, whose micro-anatomy has been specifically studied within the pedicle bones. Several ligaments hold the vertebrae in position, yet permit a limited degree of movement. Motions of the vertebral column include forward bending (flexion), backward bending (extension), side bending (lateral flexion), and rotation. Lateral flexion and rotation motions are coupled so that whenever the vertebrae bend to the side, they also rotate and vice versa. 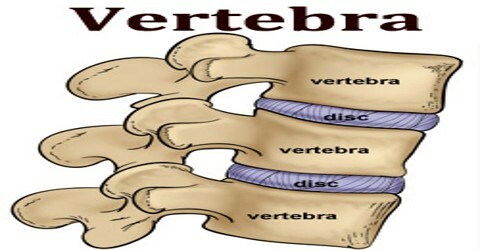 The vertebral arch refers to the lateral and posterior parts of the vertebrae. Vertebral arch carries 7 processes: unpaired spinous process (projecting dorsally), paired transverse processes for articulation with the ribs and attachment of muscles, the superior articular process and the inferior articular process processes for articulation vertebrae each other. The vertebral notches, one caudal and one cranial, together form the intervertebral foramen which serves the passage of the spinal nerves. Vertebrae contain a vertebral foramen for the passage of the spinal canal and its enclosed spinal cord and covering meninges. They also afford sturdy protection for the spinal cord. 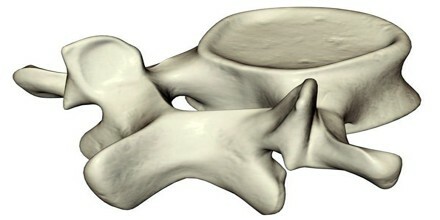 The upper and lower surfaces of the centrum are flattened and rough in order to give attachment to the intervertebral discs. It also provides the openings, the intervertebral foramina which allow the entry and exit of the spinal nerves. Similarly to the surfaces of the centrum, the upper and lower surfaces of the fronts of the laminae are flattened and rough to give attachment to the ligamenta flava. Working together in the vertebral column their sections provide controlled movement and flexibility.